With ISCA’s full support, the Accounting Standards Council (ASC) hosted the 10th Annual Asian-Oceanian Standard-Setters Group (AOSSG) meeting on 21 and 22 November 2018. The AOSSG meeting was attended by delegates from 20 national accounting standard-setters in the Asian-Oceanian region, as well as key representatives from the International Accounting Standards Board (IASB) and IFRS Foundation. 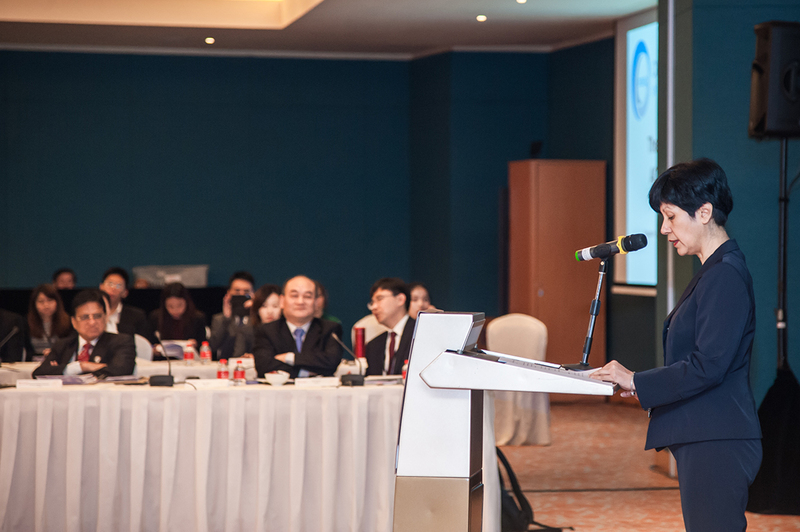 Indranee Rajah, Minister in the Prime Minister’s Office, and Second Minister for Finance and Education, delivered the keynote address at the AOSSG Meeting, re-affirming Singapore’s commitment to international accounting standard-setting. She added that the global adoption of International Financial Reporting Standards (IFRS) is a journey and not a destination, and that jurisdictions will face different challenges in this journey. In view of the shift of economic weight to Asia and digitalisation, Minister Indranee highlighted that AOSSG can play a greater role in standard-setting in three areas, namely, research activities, post-implementation reviews and initiatives. In the area of research activities, AOSSG could consider conducting research and collecting evidence for IASB’s research programmes. On post-implementation reviews, AOSSG could consider contributing empirical evidence of the post-implementation review on IFRS 11 Joint Arrangements that could be obtained from the increase of infrastructure investments in Asia. Lastly, on initiatives, AOSSG could share with IASB on the Asian-Oceanian region’s insights and perspectives in relation to digitalisation. Kevin Kwok, Chairman of the ASC, shared in his welcome speech that since its formation, “the strength of AOSSG lies in its unique ability to bring the benefits of experience and diversity to IASB in the development of robust principles-based IFRS Standards”. He added that AOSSG will have an increasingly important voice in the standard-setting arena, and it would require the collective effort of all AOSSG members to “share knowledge and experiences, encouraging greater participation, mentoring new IFRS adopters and supporting aspiring IFRS adopters”. During the welcome dinner for the AOSSG delegates, Kon Yin Tong, President of ISCA, said, “The ASC and ISCA share a deeply complementary relationship in Singapore’s financial reporting landscape – ASC is the standard-setter for accounting standards, while ISCA leads the implementation of those standards and champions quality financial reporting.” He mentioned that the IASB accounting standards are principles-based, require the application of judgement and are often complex. He highlighted ISCA’s role in supporting members with the implementation and adoption of standards in Singapore and cited one such example where the Institute “worked with the financial services industry to address challenges in applying IFRS 9”, leveraging “our strong base of technical expertise”. The AOSSG meeting had a comprehensive and full agenda. Members of IASB first provided a summary of IASB’s developments in 2017/2018. Subsequently, AOSSG members provided feedback to IASB on various projects/areas such as Primary Financial Statements, Virtual Currencies, Business Combinations under Common Control, IFRS 17 Insurance Contracts, Islamic Finance, IFRS for SMEs and accounting issues involved in bullion (gold) lending and borrowing. There were discussions on the challenges faced by countries in the Asian-Oceanian region when implementing IFRS and how international standard-setting could potentially address these challenges. ISCA as well as AOSSG members from Saudi Arabia, Sri Lanka and Thailand provided updates on the IFRS application and implementation issues in their respective jurisdictions. 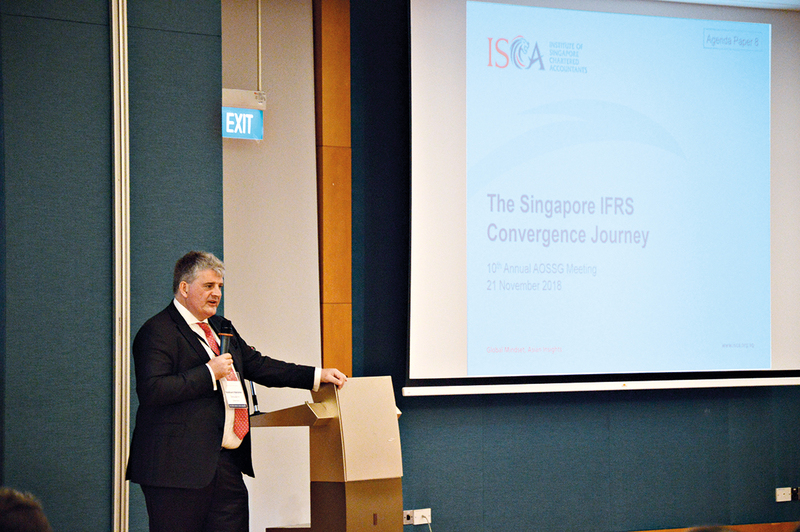 Reinhard Klemmer, Chairman of ISCA Financial Reporting Committee, spoke on lessons learnt from Singapore’s IFRS convergence journey. 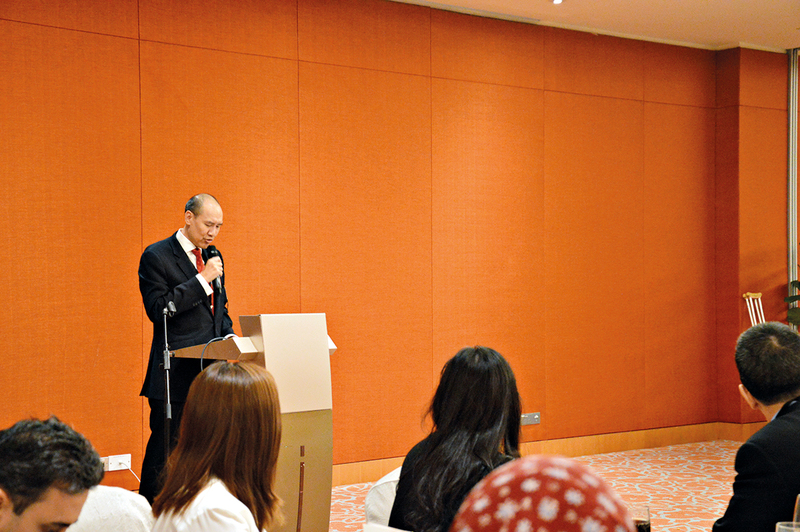 He shared that conversion to IFRS is technically challenging and requires planning and appropriate resourcing. This is contrary to market perception that because Singapore’s accounting standards are already largely aligned with IFRS, the transition is simple or does not require much effort. Challenges in applying IFRS 9 Financial Instruments and IFRS 15 Revenue from Contracts with Customers were also discussed. The complexities in meeting the solely payments of principal and interest (SPPI) criteria for financial instruments with bail-in clauses or benchmark rates, and the expected credit loss model, were some of the Singapore-specific issues discussed. Mr Klemmer also highlighted that on the revenue front, availability of data and capitalisation of cost for longer-term projects where revenue is recognised over time are key challenges. With the growth of digital companies and their increasing market capitalisation, investors are relying more on Non-Generally Accepted Accounting Principles (Non-GAAP) measures to value such companies. Unlike traditional businesses, much of the value of digital companies lie in volatile intangibles which, under existing accounting standards, would fail to be capitalised as assets on the financial statements. Mr Klemmer discussed this balance sheet dilemma with the AOSSG and questioned whether reconsideration of the current financial reporting standards is required to maintain its value proposition. Also discussed were the accounting for proceeds received from new funding models in the digital economy and virtual currencies. This conversation continued after the AOSSG meeting at the ASC-ISCA Financial Reporting Technical Forum on 23 November 2018. 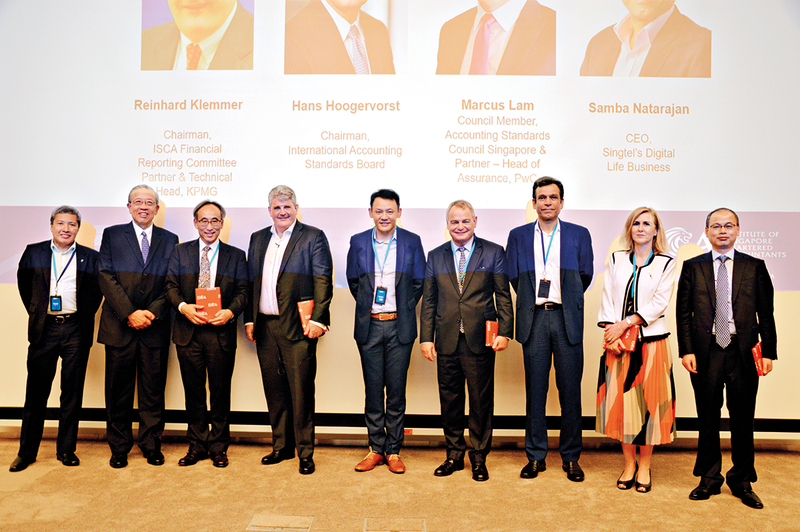 ISCA moderated the panel discussion titled “Performance Reporting and the Digital Era”, where panellists addressed challenges relating to the relevance of existing accounting standards and financial reporting. 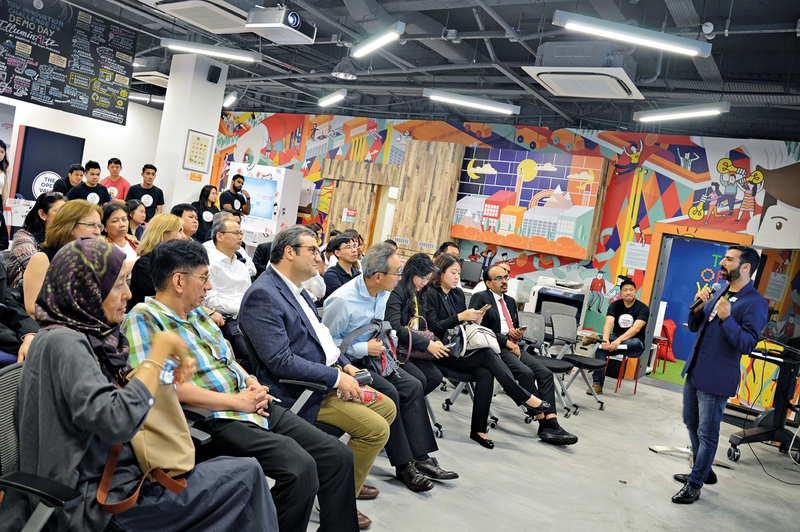 The AOSSG delegates were hosted to a financial technology (fintech) experience at The Open Vault at OCBC (TOV), where they gained insights into the fintech developments in the Singapore banking sector; they also learnt about artificial intelligence and fintech as they visited the demonstration booths at TOV. The visit provided delegates with valuable insights into the future of the financial sector, which could further develop into future accounting standard-setting work. On 23 November 2018, ISCA and ASC jointly organised the ASC-ISCA Financial Reporting Technical Forum, which was held in conjunction with the AOSSG. The Forum was well-attended by 162 participants, including members of IASB and a wide-range of stakeholders including Accounting and Corporate Regulatory Authority, Monetary Authority of Singapore, Singapore Exchange, valuers, insurance and financial services industry representatives, auditors and preparers. 3) Amounts due from related parties – classification and asymmetrical treatment by lender and borrower (FRS 1). Mr Hans Hoogervorst, Chairman of IASB, spoke about how the new expected loss model and insurance accounting standard could contribute to financial stability. He shared that these are two examples of how IASB listens to its stakeholders and adapts to the changing economy. Sue Lloyd, Vice-Chair of IASB and other IASB members shared on resources for supporting the implementation of IFRS Standards, and the key implementation issues relating to IFRS 15 Revenue from Contracts with Customers and IFRS 16 Leases. In addition, IASB gave an overview of the Discussion Paper on Financial Instruments with Characteristics of Equity. Digital companies are becoming more prominent in the economy and physical companies are becoming more digital in their operations. Key questions that arise include: Are financial statements still able to appropriately capture and communicate the value of these companies? How should cryptocurrencies be accounted for? 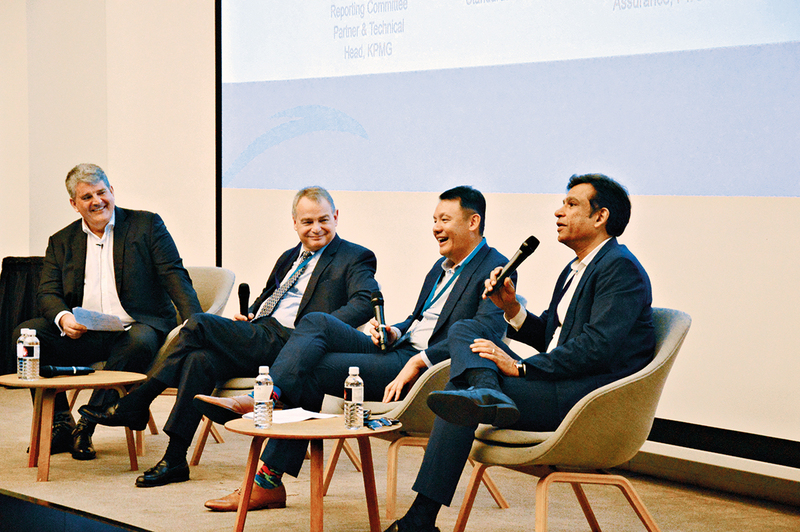 The above sets out the theme for the ensuing hour-long panel discussion moderated by Mr Klemmer, and featured panellists Mr Hoogervorst; Marcus Lam, Council member, ASC, and Samba Natarajan, CEO, Singtel Group Digital Life. In addressing this question, the panellists acknowledged that financial statements currently do not provide the complete picture as the value of non-physical assets are not recognised on the balance sheet and investors do rely on non-GAAP performance measures to value such digital companies. The seemingly straightforward solution to this issue might appear to be to allow for the recognition of such intangibles in the financial statements. But the panellists cautioned that the inclusion of such intangibles would introduce greater subjectivity to the financial statements. Valuation is an art, not an exact science. The valuation of intangibles – items without physical substance – makes it even more judgemental and subjective. Such intangibles can also be fleeting in nature. As demonstrated by the “disappearance” of large companies in the technology sector whose products seemed strong at a point in time but were quickly overtaken by other companies, any intangibles of a company could dissipate overnight. In light of the above challenges on the recognition of intangibles in the financial statements, the possibility of introducing non-GAAP measures in the financial statements was discussed since investors do rely on such measures in valuing digital companies. It was further shared that the provision of such non-GAAP measures could be made outside of the financial statements, for example, in the management commentary, and that IASB has an ongoing project on its Practice Statement on Management Commentary1. Moving onto the topic of cryptocurrencies – a new medium of exchange which is gaining popularity around the world – the key question facing the accountancy profession is, “How should these cryptocurrencies be accounted for?” Acknowledging that confusion does exist in this area, it was shared that IASB will consider issuing agenda decisions through its IFRS Interpretations Committee to provide some form of guidance on it. In closing the panel discussion, the distinguished panellists left the audience with the following concluding thought – With digitalisation, corporate reporting will evolve, and it is crucial that all stakeholders in the financial reporting ecosystem adapt accordingly or risk facing obsolescence in the new era. ISCA and ASC also jointly organised the ASC-ISCA Financial Reporting Roundtable for CFOs and Users (Roundtable) on 23 November 2018. The Roundtable was attended by representatives from IASB, preparers of financial statements, analysts as well as representatives from the accounting profession. The key topics discussed include how financial statements could better communicate the performance of companies to the users, and goodwill impairment and amortisation. Participants were generally supportive of providing flexibility in reporting performance measures in financial statements and had mixed views on whether and how goodwill should be amortised. 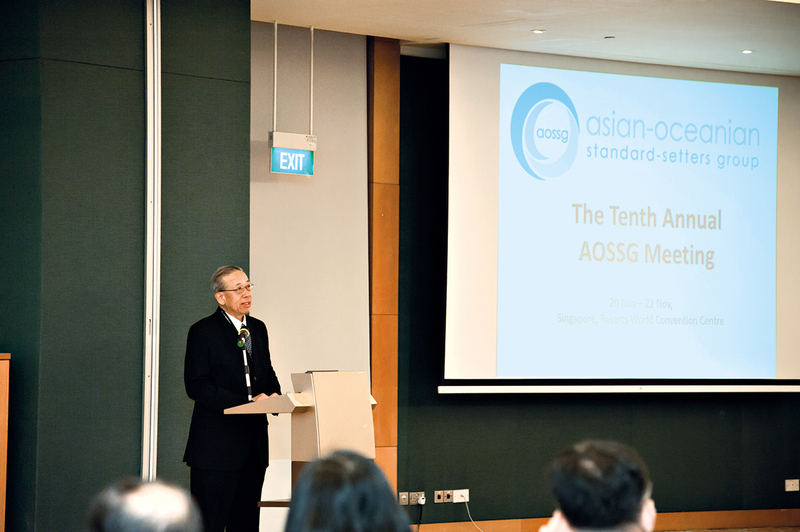 The AOSSG is a grouping of 27 national accounting standard-setters from the Asian-Oceanian region, including those from Australia, China, Hong Kong, India, Japan, Korea and Singapore. Since its formation in 2009, AOSSG has emerged to become an influential voice in international standard-setting. The AOSSG meeting serves as a key platform for national accounting standard-setters to discuss with representatives from IASB about its accounting standard-setting projects and other developments, and to share experiences in the adoption of IFRS Standards. Lim Ju May is Deputy Director, Felicia Tay is Manager, and Marcus Chan is Assistant Manager, Technical, ISCA. 1 The current IFRS Practice Statement 1: Management Commentary was published in December 2010 and provides a broad, non-binding framework for the presentation of management commentary that relates to financial statements that have been prepared in accordance with IFRS Standards. In November 2017, IASB added to its agenda a project to update this Practice Statement to include consideration of developments from other narrative reporting initiatives and acknowledged gaps in narrative reporting practice indicating that the goals of the Management Commentary and other narrative reporting regimes are unmet. For more information, click here.